Are you still here? Don't say I didn't warn you! My name is San Bergmans. I was born on 12 December 1959, in Tilburg, The Netherlands. Since my marriage early 1988 I live in Oisterwijk, which is a few kilometers North-East of Tilburg. A bit further down on this page you'll find a picture of me, just in case you wonder what I look like. At a very young age it was already fairly obvious that I had a more than an average interest in technical things. I loved taking things apart, like my grandfather's pocket watch. Putting it back together proved to be too much of a challenge though. No one had any idea of the value of those things back then. In programming that is. My first real programming steps were made on a TI-57 calculator. It had only a very limited program memory, only 50 steps if I recall correctly. Running a program was simply a matter of repeating the keystrokes which were stored in memory. After a few years I bought myself a TI-58 calculator. This calculator had more memory which was volatile at that time, which means that the memory was lost every time you switch off the calculator. Or when it decided to switch off by itself, the battery life of the thing was awful. A program had to be keyed in every time you needed it, for there were no ways to save it. In 1982 it was time to buy a real computer, an Apple ][+. It was powered by a 6502 processor and had 48k of RAM memory. Disk drives were too expensive for me, so the first year I had to get along with only a cassette recorder. Basic was nice, but I realized that programming in machine language was much more powerful. I did not have an assembler, so I hand assembled a few programs. This was very time consuming, but rather educational. Documentation was made with a mechanical typewriter, so I had to adjust my typing force every time I switched between computer and typewriter. About a year later I had enough money for a pair of disk drives. The storage capacity of the Apple disk drives was very limited, only 140k could fit on one disk. A couple of years later TEAC came with 80 track drives which had a storage capacity of 640k per disk (320k per side). Those drives were not supported by Apple, so I had to use one of the few available patched disk operating systems. None of them were to my satisfaction though. So I patched the original Apple Dos myself and named it S-DOS80, which worked very well. It is amazing how much you can learn when you patch existing programs like this. All extra features had to fit in the limited space that was available. Some features of the DOS were removed (like the INIT command which formatted new diskettes). Some routines were optimized to free every single byte possible. And it did work, even better than the original Apple DOS back then. For one thing it was a lot faster than the original Apple DOS. It's a pity internet didn't exist back then, otherwise I might have been famous for it. Hardly anybody knew I had such a wonderful disk operating system at the time. At one point I've built my own Apple clone computer. The motherboard I'd used had a built in Z80 processor, so I didn't need a separate Z80 card in case I wanted to run CP/M programs. The front panel was full of status LEDs and control switches, it really looked like a computer from a science fiction movie! This new computer needed a keyboard of course. Proton had a wonderful keyboard back then, so Proton it was. But I didn't like the software that much. And it was lacking some useful keys. The keyboard frame held about a dozen holes for extra keys, so I bought some extra keys and filled every hole. I was probably the only one who owned an Apple ][ computer with a hexadecimal keypad. I had changed the 6802 software in the keyboard to accommodate for these extra keys. I even added programmable function keys, which could easily switch between functions for several programming languages and text editors. I started some small experimental projects with stand alone micro processors. For this I first built and programmed an EPROM programmer as an expansion board for the Apple. It programmed chips up to 32k (27256). After a long search for the proper tools I found that the SC-Assembler, written by Bob-Sander Cederlof, was the most suitable. But after a while I found that the SC-Assembler needed some improvements. The 6502 version of the assembler was OK to me. But other processor crosses were rare and the ones that were available had so many limitations that it was hard to work with them. After wasting a whole week trying to find a lookup error in a hand assembled 8048 program I decided to program my own cross assembler, the SB-Assembler. I disassembled the SC-Assembler and used the knowledge I gained from that process to write my own version with many extra features. Some of the projects I came up with required some sort of connection to the computer, which would really make them useful. Alas the USB bus wasn't invented yet, so I defined the SB-Bus. It could connect up to 125 devices to one single serial port, without the need to swap plugs every time you wanted to use another device. After a few years the inevitable happened: I had to switch to the PC, a Tulip 80286 with 3MB of memory and a 40MB hard disk. The schematic drawing programs for the Apple were too primitive to be practical, and the word processing capabilities were also quite limited. So my desktop was filled with an Apple ][ and a PC. The Apple became more and more obsolete because the PC took over more of its tasks. The only tasks the Apple had left were to program in assembly and to burn EPROMs. To free my desk from the Apple I desperately needed a cross assembler on the PC and a stand alone EPROM programmer. In 3 month time I wrote my first 8086 program, in assembly: the SBASM for the PC was born. It took a few extra month to finish the extra crosses, but the migration form Apple to PC was almost complete. With pain in my heart I waved my Apple ][ goodbye. I'm a reasonable early PC user, so I'm familiar with the natural Microsoft evolution of operating systems, up until XP. I also started using the Unix (FreeBSD) operating system running a home server. This was later changed to Ubuntu Linux. Now I'm a full time Linux Mint user. Since Bill Gates now has dedicating his life to charity it is no longer acceptable for me to use his software without paying for it. And since I refuse to pay for programs which are not ready yet I have permanently switched to Linux many years ago. And I have never regretted that decision a single minute. 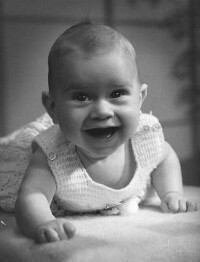 As promised, here is a picture of myself (Must have been 1960). Ain't I cute? If you look a little bit closer you will find a more recent picture of me, taken about 50 years later. In 1979 and 1980 I worked at Fluke for about 8 months (6 month as an apprentice, and 2 extra months during my school holiday in the final test department). For the first 6 month my main job was to build test systems for new PCBs. During the last 2 months I repaired the Fluke 8020 and 8024 series digital multi meters at the production test line. From 1982 until 1988 I was employed at Abra Beheer, the Dutch representative of Sansui and Fisher consumer electronics, among other brands. My job was to repair audio and video equipment. Later Sanyo business machines was also added to the main activities, and my task became repairing copiers, electronic typewriters, stand alone text editors and fax machines. I also took the first Sanyo fax machines in Holland through the PTT approval. From 1988 until late 2003 I worked at Revah Service. Here we used to repair ITT consumer electronics. Later that brand name was changed to Nokia. At first my job was to repair TV sets. But gradually I started repairing analog and digital satellite receivers, which ended up being my main occupation. I also did some component level mobile phone repairs and digital JVC camera repairs. Unfortunately Nokia centralized its mobile phone service in Europe, which lead to the closing down of Revah Service. Fortunately the satellite branch survived and the remains of the previous company were taken over by Copaco, a big IT distributor in the south of the Netherlands. Just a couple of years later Nokia completely left the CE market, including the satellite and cable set-top box products. Fortunately for me we were able to introduce a new cable set-top brand in the Netherlands, Humax, which became very successful. Eventually this generated more than enough work for me. After a 26 year long career in the consumer electronics market I finally got the opportunity to switch to a completely different market. Now I'm working for a small young company called Dual Inventive, which focuses on the development and production of rail safety products. I am also a member of the reborn local Wisclub. Each member adopted a Smurf's name and my name is Cartoon Smurf. All my computers have cartoon character names, therefore my home network bares the name of Cartoon Network. We are a small group of computer and/or electronics enthusiasts. Lately we're able to hold a meeting just about every month. These meetings are mainly used to swap ideas, knowledge and a joke or two. Our motto is that it's a shame to waste good old electronics (Wasting Is a Shame, hence the name WISClub). Usable parts are often salvaged from scrap and end up in our ever growing stock, waiting to be used in some kind of new "useful" project some day.